2011 saw a lot of action in the social media stratosphere, especially when it came to Facebook marketing tactics. Each year social media will continue to change at a faster pace and marketers will need to continue to stay ahead of the curve. Here’s a list of some of the most important tips & tricks for marketing on Facebook from 2011. 1. Use the improved menu for Facebook Page Administrators with more than one Page.Detailed in this article on AllFacebook, the recently added feature eliminates a few clicks to view the notifications to your various Facebook Pages. In a nutshell, it makes the whole process of monitoring your various communities on Facebook a lot quicker. 2. 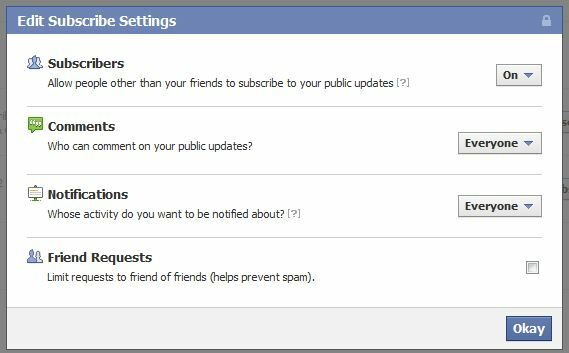 Enable subscribers on your Facebook profile. Are you actively sharing content about a particular topic? Is one of your clients a well known personality? Are you a journalist? This year Facebook made it so people, who couldn’t view your activity before, can now follow your personal profile and follow information you choose to make public. Here’s how to enable subscribers to your profile. 3. Add the Subscribe button to your website, especially if you have multiple contributors. Of course, you’ve got to enable the Subscribe feature to your personal Facebook Profile first. Here’s where to find the code to add the plugin to your website. 4. Posting on your Facebook Page between 8PM & 7AM receives 20% more user engagement.Buddy Media produced a white paper on strategies for effective wall posts, sharing a variety of insights on marketing for Facebook based on the analysis of 100’s of Facebook Pages. 5. When posting on your Page’s wall, tell your audience to Click “LIKE” in your posts. Calls to action work wonders for driving engagement to your content in the newsfeed. Here on CVS’s Facebook Page they’ve used this technique at the end of their post to increase the amount of like’s this video received. 6. Use fill in the blank’s style posts for high levels of engagement from your Facebook audience. 7. Optimize your Facebook Page’s photo banner to give a branded experience to your fan base. 8. Have your Page favorite/like other Facebook Pages of related product lines, other store locations or any other relevant subject matters to feature on your Page. These featured likes will rotate between 5 different pages each time your browser refreshes, although you can add more than 5 pages to the list. It’s mainly a chance to express what your brand like’s, giving it a voice it didn’t have prior to the February Page redesign. 9. 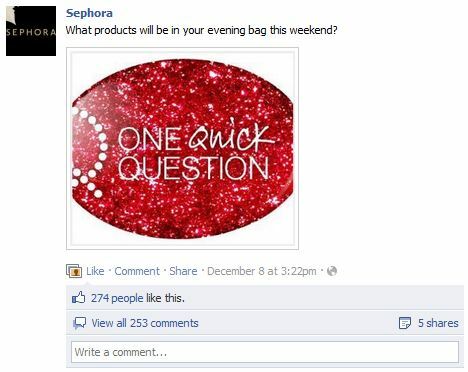 Ask open ended questions in your Facebook posts to help increase the amount of comments that post receives. 10. 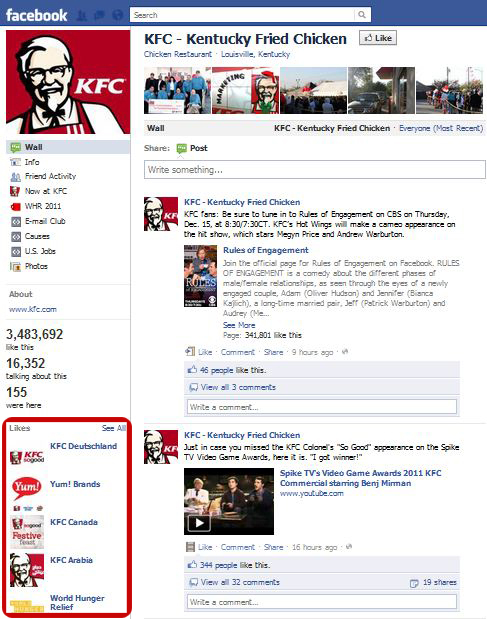 Use Sponsored Stories to increase brand lift and utilize this new social aspect of Facebook ads. When people hear about a brand from their friends, they’re twice as likely to engage. 11. Switch between uploading the video content you share from your YouTube channel and from Facebook videos. Uploading your videos on YouTube will get the video greater exposure in the search engines, but uploading your videos in Facebook will get the video added exposure in the newsfeed and the ability for someone to like your page and video from within the video itself. 12. Optimize your Profile photo to highlight your brand, product lines, promotions, fans and more. 13. Choose to set your wall to either display posts by everyone or just from your Page. For some brands, it might be best to hide posts from fans on the everyone tab and only show the Page’s marketing messages as the default views. This depends on many factors, one of which is audience size. 14. Use the vertical link menu on the left hand side of your Page to display applications and destinations that serve as resources for fans about your brand and offerings. 15. Engage with other Pages as your Page, to help drive engagement between Pages and between the related audiences of those Pages. With the Facebook Page redesign in February, Page admins have been able to log in as their Facebook Page and act as if they’re a regular user that’s able to comment, like and interact on Facebook. 16. When creating tabs for your Facebook Page, use the Static Tab 2.0 application. It’s free, easy to use, gives you many options for customization, helps you move away from soon to be deprecated FBML to iFrames and allows you to add up to 7 tabs to an unlimited amount of Facebook Pages. Here’s how to setup your Facebook tabs using Static Tab 2.0. 17. 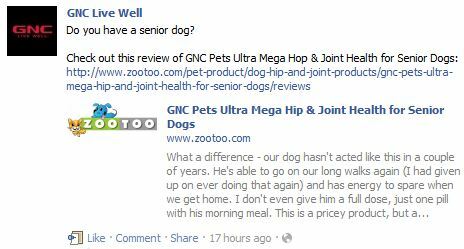 Don’t rely on Facebook’s link function alone, leave the link at the end of the text in your post as well. By giving your fan base more opportunities to click a link in your post, the more clicks you’ll get to the content you’re sharing. 18. Schedule your posts for when you’re away from the computer, but want to reach audiences at times of the day that have the highest levels of engagement and less competitions from other Facebook Pages. Previously, Facebook’s newsfeed algorithm, EdgeRank, would give less visibility to a Page’s content when posted through a third party tool like HootSuite or TweetDeck. Now, Facebook’s newsfeed has been altered to not negatively affect posts of this nature, allowing for the same visibility as if it was posted from Facebook. I recommend switching between posting from Facebook and the third party tools. 19. Target the posts on your Page by either location or language to help increase the relevancy to the various segments of your audience. Here’s a few ways to maximize your relevance with the post targeting feature. 20. Mentioning your fans by name in the comments on your Facebook posts is one of most beneficial ways to give a personal touch to your brand’s Facebook presence. In some cases you’ll be able to use an @ sign and tag a user in your comments to them, in other cases you’ll just have to type out their name. Either way, this gives a personal feeling that social media is all about, connecting with your advocates one on one. 21. 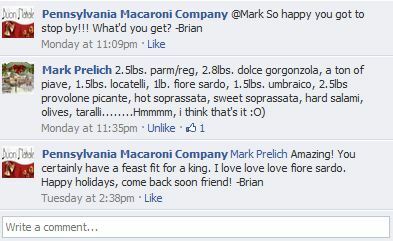 When engaging with your Facebook audience, sign your name when directly interacting with users. By signing your name after a comment, you’re removing the mystery behind who your audience is actually chatting with and again, adding your personal voice to your brand’s page. 22. A handy tip for measuring successful engagement per post, look for 1% of your audience to interact with each post that is shared on your Page. Just take your existing audience size, divide it by 100 and the result will be the number of people who should be engaging with your post via shares, comments & likes. 23. Enable users to tag your Facebook Page in their photos to help organically grow your audience and impressions. Go to Edit Page, then Manage Permissions and be sure to check off the box that says People can add tags to photos by [Your Page Name]. 24. To improve the SEO of your Facebook Page, set three keyword rich sub-categories for your Place Page. Go to Edit Page, then Basic Information and then define these sub-categories keeping Facebook search and the search engines in mind. 25. Draw your audience from your YouTube videos and channel to your Facebook Page by including annotations throughout your video with a URL to your Page. 26. 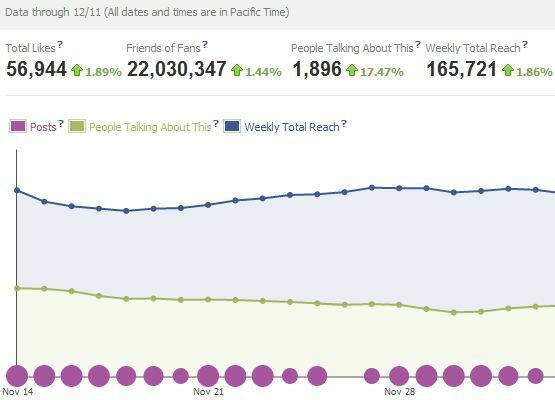 Use the Talking About This metric to get a true sense of the engagement on your Facebook Page. This public metric give you a better sense of your interactions with your audience, outside of the number of people that just like your page. 27. 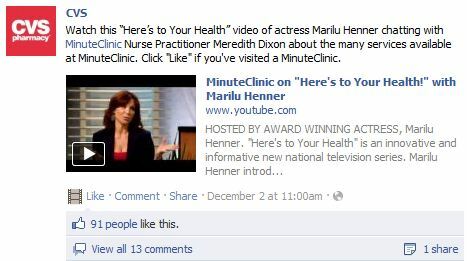 Add a Facebook Like Box to your website to easily allow your web visitors to become a fan of your Facebook Page. 28. Incorporate photos in line with your other posting strategies, to get higher visibility in the newsfeed. Photos have a higher weight with Facebook’s EdgeRank (plus people love them), so utilize them when you can with other strategies to help get your content get more traction. 29. Repost the same article on your Facebook Page for added engagement, but be sure to alter the text/title of the post to give the appearance of different content. Utilize this reposting technique over a short period of time so there’s a gap between when you post the first and second time, while also not waiting to long and risk losing the relevancy of the content you’re sharing. 30. Keep the narrative short to maximize the number of shares of your content, preferable 80 characters or less. Learn some of the many other ways to get your Facebook content shared. 31. Don’t automate connections to your other social networks on your Facebook Page. Having your Twitter feed or YouTube videos as a tab on your Facebook Page is a wonderful way to give your audience as much content about your brand as possible. However, it’s important that your tweets, YouTube videos or content from other platforms aren’t being automatically added to your Facebook Page’s wall. This could lead to too many posts on your Page, repetitive content being shared or irrelevant platform specific messaging, all of which could being to irritate your fan base. 32. Use the updated Facebook mobile app to engage with your fans on the go. There’s a few different versions of the application depending on what phone you have, here’s a deeper look at how to manage your Facebook Pages from the iPhone. 33. Browse Facebook Studio for insights on how others are marketing on Facebook, especially when it comes to creative and innovative ideas that Facebook themselves thought were one of a kind. 34. Occasionally drive traffic to your website from the content you post, being clever or mysterious will often lead to higher click through rates. By clever or mysterious, I mean be vague about the destination of your link but enticing with the copy you use in the post. Basically, teaser content so people are interested to visit your link. 35. Use Facebook Questions to add some variety to the content you share and as a way of polling your audience to see what aspects of your brand they truly enjoy. 36. When offering coupons, don’t make fans do the math. Buddy Media’s study incidcates that “$ off” offers generate twice the engagement of “% off” offers for the retail industry on Facebook. 37. Share milestones you’ve reached on Facebook or as a brand with your audience. Whether you’ve finished a volunteer project as a company or reached 300,000 fans on Facebook, tell your fans, so they can help celebrate and spread the word. 38. Encourage check-ins on your Page and at your physical location. Although Facebook Deals was a flop, getting traction from check-ins on Facebook is still a useful way to grow organic impressions of your brand, especially when it comes local & small businesses. 39. Share the testimonials, positive feedback and recommendations about your brand. If your fans love your brand and are vocal about it, share this sentiment with the rest of your audience, making sure to mention the original feedback. The addition of the recommendations feature on a Facebook Page, specifically when you first like a Page, gives marketers an opportunity to promote their praise and feature one of their most active and happy fans. 40. Measure your return on investment with Facebook’s updated Page Insights. The new version of Page insights has shifted the focus of these internal analytics around engagement as opposed to audience size. Understanding how each post has affected your Page’s virality overall is a wonderful way to see what worked and didn’t work and how you can continue to strategize for the future. Did you find any of these tips applicable to your own Facebook marketing strategy? Share what Facebook marketing tips and tricks you live by in the comment section below.